9 Beautiful Plants and Flowers to Add to Your Summer Planters – Toronto Special! The summer is here in full force. An easy way to add the summer spirit to your home is with beautiful summer planters. 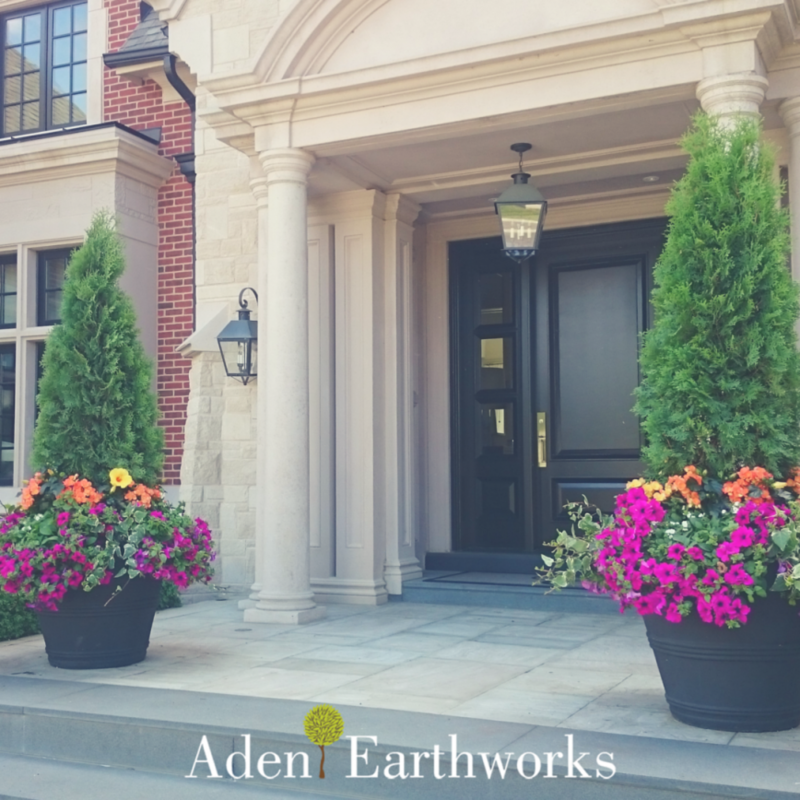 Our team can create custom planters for you right at your home, ensuring the style and selection of plants matches your outdoor space and preferences. A tropical summer planter featuring Elephant Ears, Dragon Fly Begonias, Geraniums, and trailing Ivy. If you’re not up for ordering custom planters from our seasonal planter team, no worries – here are suggestions for summer flowers and plants to include in your planters and urns. Purple New Guinea Impatiens – More tolerant of sun then other impatiens, these gorgeous annual flowers are available in a variety of lustrous colours. Great for containers, a pretty low maintenance selection. White Petunias – A resilient annual that are a favourite of gardeners everywhere, particularly great for mid-spring and late fall blooms. Offered in a variety of colours, including blue, pink, purple, red, and white. Trailing Ivy – We love adding this to our urns, it trails down containers in a beautiful way, increasing the visual size and impact of your summer planters. These plants require evenly moist soil, so be sure to water them regularly. Mandaville – These gorgeous flowers are a great choice for summer, as they love the sun. 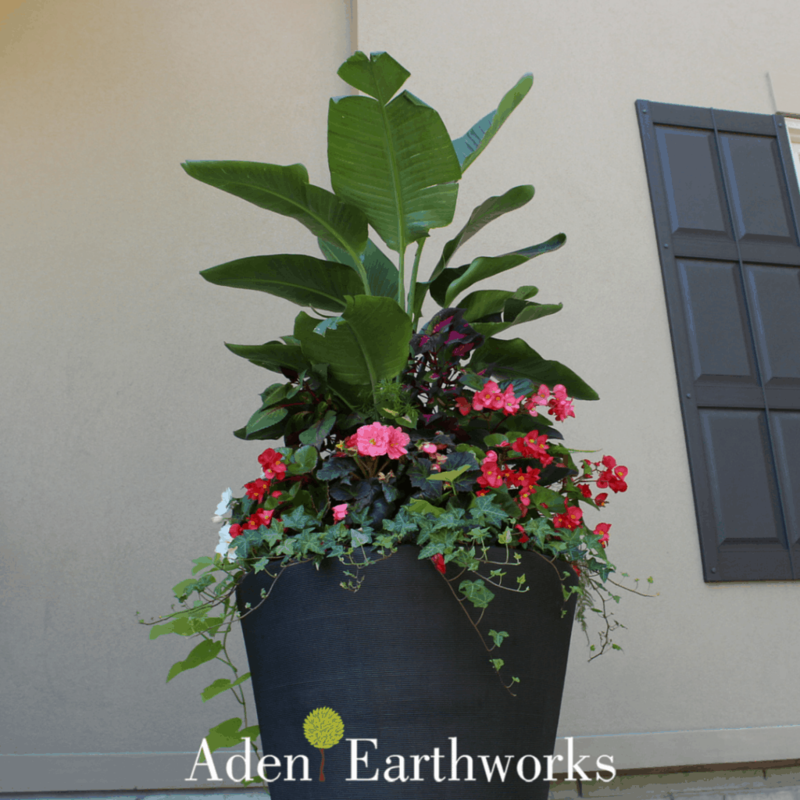 We often add them as centerpieces to our planters, as they give plenty of great height. Make sure you water these beauties thoroughly, water them slowly so soil gets evenly moist. Tuberous Orange Begonias – These lovely bright flowers can be added to urns or to hanging baskets, as they can arch easily. These annuals are available in green, orange, pink, or white colours. 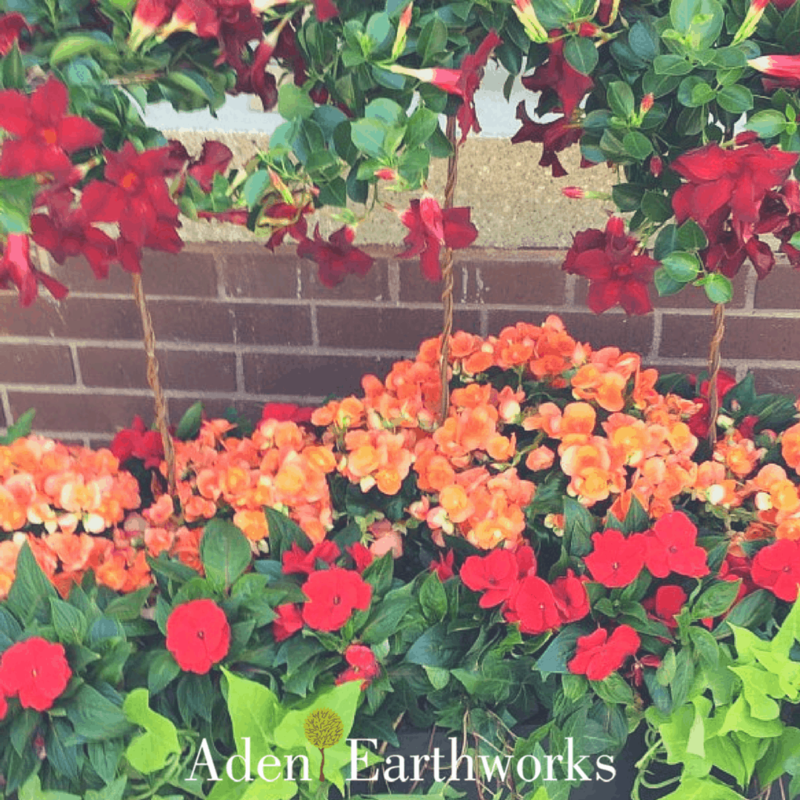 Beautiful summer colours in a planter featuring tuberous orange begonias, red million bells, lime potato vine, trailing ivy and red Mandavilles. Red Million Bells – These flowers are aptly named for their lovely bell-like shape. They love full sun and well drained soil, making them a great addition to urns and planters. Available in red, pink, yellow, and white colours. Elephant’s Ears – add a tropical aesthetic to your outdoor space with the big luscious leaves of the Elephant’s ear. Their have a beautiful texture and are great in containers. Dragon Wing Begonias – A big beautiful plant that does very well in containers, as long as its given good room to grow. This begonia is versatile and does well in sun and shade. Available in pink, white, and red flowers. Geraniums – These has among the longest blooming times of any flowers in the garden, in addition to gorgeous brightly coloured flowers – you get some unique foliage. Requires full sun. See more gorgeous outdoor inspiration, including seasonal plants, on our social channels: Facebook, Instagram, and Twitter.